Russia and the Ottoman Empire had been officially at war since October 4, when the Ottoman Sultan had given into the pressures of opinion and declared war. The Russians had begun their move, and on November 30, 1853, at the port of Sinop on the Black Sea coast of northern Turkey, the Russians approached a small fleet of Ottoman warships and transports which had chosen to remain at port under the protection of shore batteries. The small fleet was ordered to fight to the last man. The Russians attacked, and the wooden Turkish ships burned. Of the 4,400 Turkish seamen, 3,000 were killed. Then the guns of the Russian ships destroyed the port and its defensive installations. The Russians had performed an efficient naval operation, but British newspapers screamed of atrocities and a massacre. After Russia's attack at Sinop, anti-Russian fervor raged in Britain. It was widely believed in Britain that Turkey was unable to defend itself against the Russians and that the Russians had to be defeated. The anti-Russian fervor was also in Parliament. Many liberals there had been opposed to war because wars cost money, but their reluctance was overcome. The British feared that the Russians were seeking to control the straits between the Black and Adriatic seas. They feared the Russian navy breaking out of the Black Sea and threatening their route on the Mediterranean Sea. And they were afraid of Russia dominating the Baltic Sea. And the British were confident that their navy was infinitely more powerful than the Turkish fleet at Sinop had been. Queen Victoria. Click for a more youthful image. Amid the war fever in Britain, a rumor was passed around that Queen Victoria's husband, Prince Albert, was a Russian agent. Prince Albert was German and the German state of Prussia was reluctant to join the British and French in a coalition against Russia, which was on Prussia's eastern border. Many in Britain saw German reluctance as support for Russia and as making themselves tools of Russia's ambitions. A newspaper in Scotland circulated the treason charges, and a few other newspapers in Britain repeated the accusation. In London, thousands waited by the doors of the Tower to see Prince Albert escorted into that prison, and rumors were afloat that Queen Victoria intended to stand by her husband and go with him. Defenders of Prince Albert were able to squash the rumors, which Prince Albert labeled as the "stupidest trash." Publicly, Albert described himself as having the sentiments of the British, and, as if to prove his point, he described Nicholas I as "a tyrant and the enemy of all liberty on the continent." "The Turk," he wrote, "is a fine fellow." By January 1854, a fleet of British and French warships had passed through the straits and into the Black Sea. In March, Britain, France and Turkey formalized an alliance. At the end of the month, Britain and France declared war on Russia. Following the declaration, Queen Victoria wrote of "the great sinfulness" of Russia as having "brought about this War." She spoke of the declaration of war as "very dignified" and added, "May God give it his blessing and grant that as little blood as possible be shed." Later she wrote, "...our conduct has been throughout actuated by unselfishness and honesty." On April 22, the British navy shelled the Russian port at Odessa. And Queen Victoria relished the virtue of attacking only military targets. "The town," she wrote, "has not been touched." In June, British and French warships sailed through the Gulf of Finland and reconnoitered the Russian navy base at the island of Kronstadt, near St. Petersburg. In August, 10,000 French troops and 1,000 British besieged and forced the surrender of Russian forts at Bomarsund amid islands in the middle of the Baltic Sea. In August, a squadron of British warships bombarded Kola, near Murmansk, in Russia's far north. Austria seeking advantage for itself threatened to enter the war on the side of the Ottoman Empire, and Russia responded by withdrawing from Walachia and Moldavia, allowing Austria to move its troops there without confronting them. The British and French attacked at the Russian naval base at Sevastopol, on the Black Sea, which the British saw as a threat to their interests in the East. 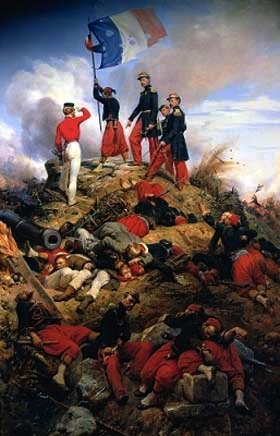 On September 14, 1854, a British and French force already weakened by cholera, with a few thousand Turks, landed thirty miles north of Sevastopol. On September 20, at the Alma River, a major battle was fought – a battle that was more like a riot than military maneuvers. Many were lost on both sides, but the Allies held. News of the war traveled slowly, and on October 3rd Queen Victoria wrote to her uncle, Leopold, of her "noble troops" having behaved "with a courage and desperation which was beautiful to behold." Twenty days later she added: "My heart bleeds for the many fallen, and I consider that there is no finer death for a man than on the battlefield!" The Russians were not giving up as the British had expected. The British and French had better weapons, their rifles having a range of 1000 yards while the Russians were still using old smooth bore flintlock muskets with a range of only 200 yards and, according to the British, taking little care to shoot straight. But the Russians, it is said, were willing to fight to the death for their faith and for Holy Russia, urged on by the priests who had accompanied them into battle. Artistic glorification: Raising the French flag on the Malakoff fortification. The Russians believed that spirit counted – a theory then being tested. With their warships, the British and French dominated the Black Sea and transport to the Crimea was easier than Russian transport across land. Having few rail lines, the Russians were using horse drawn supply wagons, inefficient in that much of what was carried was feed for the horses. And during the rains of autumn the hundreds of miles of land they had to cross was mud. What was happening was dutiful people following incompetent leadership, a collective failure punctuated with stupidity – a social dynamic that would appear sixty years later, in 1914. Their's but to do and die. Some of the brigade survived, 118 were killed, 127 wounded and 60 taken prisoner. Four of the dead were trumpeters. Killed also in the action or destroyed afterward were 335 horses. Adding to the misery, Britain had gone to war without foreseeing the need to supply its troops over a long period with food and medical assistance. 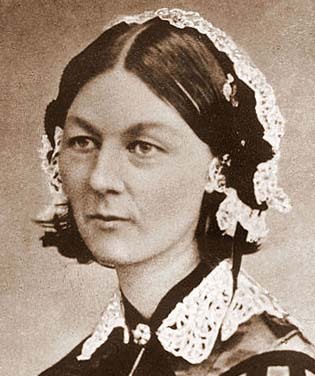 Money was raised in Britain for medicines for the troops, and, in late October 1854, Florence Nightingale left Britain with 38 nurses heading for the Crimea. Already, studying on her own, she had made herself an expert in hospital administration. At the front she organized care for the wounded, cleaned up the care areas and cut mortality rates. It was a beginning for the nursing profession in Europe. The Russians also had come to accept the involvement of female nurses. The winter of 1854-55 was miserable for both the Russians and their enemies in the Crimea. British soldiers are described as having been "clothed in rags, cold, hungry and short of everything." In the spring of 1845, the Russian supply route to the Crimea became again a sea of mud. In September, Russia abandoned its battle areas in the Crimea. The son of Nicholas, Alexander II, was ready to make peace, and so too were the Allies. The war – the first to be photographed – came to its formal end at a conference in Paris from late February to late March, 1856. The treaty produced by that conference, signed by Britain, France and Austria, attempted a new international order. The treaty guaranteed Turkey's independence and territorial integrity. It moved Russia back from the mouth of the Danube River, gave Bessarabia to the Ottoman Empire and left "His Majesty the Sultan" with suzerainty over Walachia and Moldavia. The Black Sea was declared a neutral zone, open to all nations (through the straits) but not to warships, with Russia under instructions not to maintain a navy or coastal fortifications on its Black Sea shores. Russia was obliged to give up its claim of protector of Orthodox Christians within the Ottoman Empire. And an international commission was to assure safe navigation on the Danube River. The Russians are said to have lost 40,000 killed in action and 60,000 to disease. France is said to have lost 20,240 killed in action and 75,375 to disease. Britain's loss was 4,602 killed in action and 17,580 to disease. Figures for the Ottoman Empire are unknown. Tsar Alexander II saw the war as having exposed Russia's backwardness. Russia, he believed, would have to modernize economically and socially if it were to function as a great power. The British interpreted the war as a success by imagining that the Russians had been stopped. And in Britain were some minor cultural changes. During the Crimean War smoking had come into fashion among upperclass men – men who, before the war had looked upon smoking as vulgar while military men of lesser status had been inclined to smoke as a demonstration of their worldliness and daredevil attitude – their manliness. Beards had also come into fashion – all this an imitation of Britain's military men in the Crimea, viewed by the nation as war heroes.